Often viewed as self-sufficient, Roman farmers actually depended on markets to supply them with a wide range of goods and services, from metal tools to medical expertise. However, the nature, extent, and implications of their market interactions remain unclear. This monograph uses literary and archaeological evidence to examine how farmers – from smallholders to the owners of large estates – bought and sold, lent and borrowed, and cooperated as well as competed in the Roman economy. A clearer picture of the relationship between farmers and markets allows us to gauge their collective impact on, and exposure to, macroeconomic phenomena such as monetization and changes in the level and nature of demand for goods and labor. After considering the demographic and environmental context of Italian agriculture, the author explores three interrelated questions: what goods and services did farmers purchase; how did farmers acquire the money with which to make those purchases; and what factors drove farmers’ economic decisions? 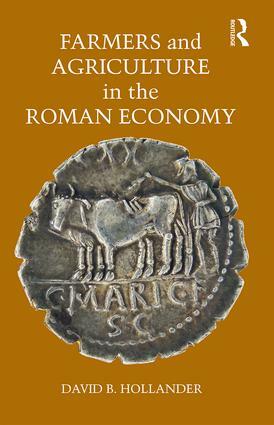 This book provides a portrait of the economic world of the Roman farmer in late Republican and early Imperial Italy. David B. Hollander earned a PhD in Ancient History from Columbia University (2002). He published his monograph Money in the Late Roman Republic in 2007 and served as the economy editor for The Encyclopedia of Ancient History (2012). He is an associate professor in the History Department at Iowa State University, USA.